Here are a few of the best tips for growing spinach in backyard or container vegetable gardens! 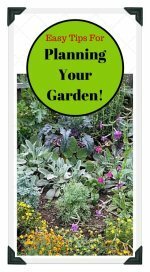 Learn how easy it is to plant, grow, care for spinach plants in your garden. 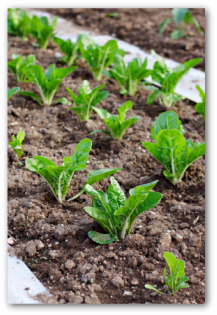 Try planting spinach in your in-ground, raised bed, square foot, or container vegetable garden this year! You will be surprised at how quickly it grows, and how delicious it tastes. Spinach is easy to grow in any type of vegetable garden. 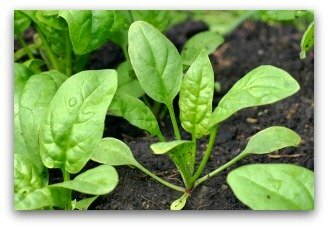 Spinach can be planted from seeds, and is easy to plant and maintain. Even a small vegetable garden can include spinach, as it doesn't take much space. When planning your vegetable garden this year, be sure to include a row of spinach! Bountiful harvests can be produced in the unlikeliest of places! A window box or patio container garden can be used to plant edible and attractive spinach. Gardeners cramped for space can turn a bright sunny spot into an area that yields healthy vegetables for their families. Spinach plants will also thrive in lightly shaded locations. Most spinach plants do not mind a bit of crowding. In fact, varieties have been developed for small spaces. Recommended varieties for growing spinach are Virginia Savoy, Dixie Market, Hybrid 7, and Bloomsdale Longstanding. Seed germination for growing spinach is 10-14 days. Sow during cool weather in a prepared garden bed. Keep soil moist to speed germination and encourage quick growth. Spinach may be grown in single rows but adapts well to double cropping and wide row techniques. Days to harvest are 45-60. Spacing between rows needs to be 14-18 inches at a depth of ¾ when planting spinach. Space between plants should be 3 to 5 inches. 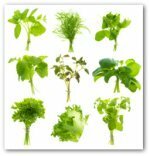 Plants needed per person of this nutritious vegetable are 30-40. Spinach is tolerant of frosts and light freezes. 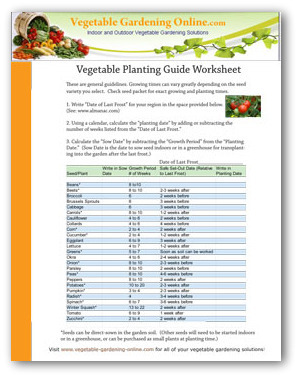 For additional planting and growing information, download our vegetable planting guide worksheet. Fertilize lightly every 2 to 3 weeks with 6-6-6 nitrogen-only fertilizer. The numbers of a fertilizer analysis indicate the percentage of, in order, nitrogen, phosphorus, and potassium. 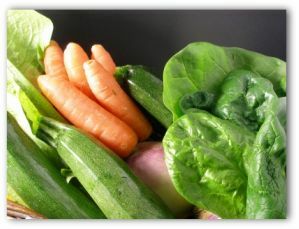 Minor nutrients such as iron, boron, zinc, and manganese are often included. Use mulch to stretch the intervals between watering. Plants can be harvested for 2-3 weeks. When a seed stack appears, cut and use the entire plant. To ensure a continual supply, make monthly sowing while the weather is cool. For gardeners interested in growing spinach in warm weather, you can try Malabar and New Zealand species, which do well spring through the summer. Malabar also known as Ceylon can take the heat. It is climbing spinach and needs to be trellised. Start plantings from seeds or cuttings. Two vines should provide a sufficient harvest for growing spinach to supply your family with its health benefits. Prune the plants to restrict growth getting out of hand. Use the tender leaves and stems as substitutes for true spinach. Fresh Spinach with Other Vegetables Ready for Stirfry. 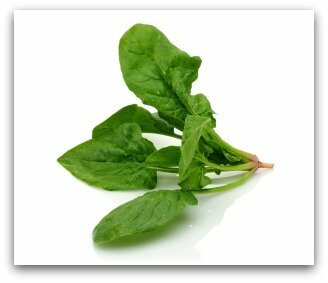 The New Zealand species of spinach is planted from seeds and grows as a bushy herb. Clip the vigorous growing branches as needed to cause branching. The clippings can be eaten. If you have difficulty growing spinach in the fall, plant during cool weather. Seedlings are susceptible to rots when the weather is too warm. When plantings repeatedly fail, consider fumigating the soil with Vapam. Follow soil solarization techniques described below before attempting to replant the crop. When the soil is heated to and held at temperatures above 120 degrees, pests such as nematodes are destroyed. The garden must be in the full sun, the ground should be loose and watered well. This technique is called solarization, and works well during the hottest days of summer. Cover the prepared site with clear plastic and seal the edges to retain the sun’s heat. Treatment should continue for four weeks to destroy nematodes and longer for disease control. It Helps to Rotate Your Spinach Crop! Rotating your spinach crops each year is one of the best guidelines you can use to ensure an abundant production of the vitamin packed vegetable every season. At harvest time, begin harvesting spinach plants when the leaves are 3 to 4 inches tall. Cut individual leaves or the entire plant. Spinach is easy even for a beginner vegetable gardener. 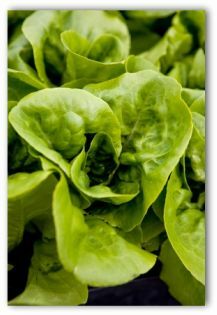 It is a healthy delicious addition to any type of vegetable garden design. If your kids don't love spinach, have them plant some spinach seeds, and take care of them in the garden. They will be easily tempted to taste their spinach either fresh or lightly steamed from the garden. Growing spinach is a great way to teach important life-skills, and encourage healthy eating habits. You know Pop-eye had it right!